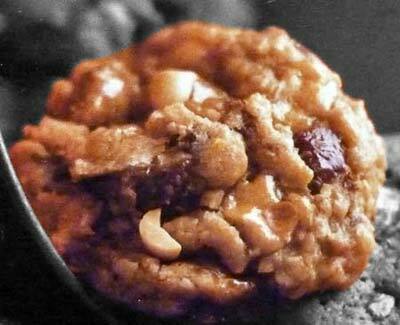 If you love the buttery crunch of peanut brittle, you'll want to bake up a batch of the Peanut Brittle Cookies today! Peanut Brittle is a sweet confection that combines carmelized sugar with peanuts and is then cooled and broken into piecese. You may also come across almond brittle or pecan brittle (especially during the holiday season) - but they are a little more unusual. Other confections such as Almond Roca, Nougat and Toffee are very similar to brittle. We always recommend baking your cookies with the highest quality ingredients you can find and these brittle cookies are no exception. We've never made our own peanut brittle at home, but doing so would allow us to turn these into the ultimate homemade cookies! Line a baking sheet with foil and lightly grease the foil or alternatively use a silpat baking mat. In a medium mixing bowl with an electric mixer on medium-high speed, beat the butter and shortening for 30 seconds. Beat in the brown sugar, baking powder and baking soda until combined. Beat in the egg and vanilla until well mixed. Beat in as much flour as you can with the mixer, then stir in any remaining flour with a wooden spoon. Stir in oats, chopped chocolate and 1/2 cup of the crushed peanut brittle. Drop dough by heaping teaspoons at least 2 inches apart onto prepared baking sheet and slightly flatten each mound. Bake for 8 minutes then remove from oven. Sprinkle each cookie with some of the remaining crushed brittle, gently pressing it in to each one. Return to oven and bake for 4 to 5 more minutes, until edges are lightly browned. Allow cookies to cool slightly on pan for about 2 minutes before transferring to wire racks to cool completely. This recipe yields about 24 Peanut Brittle Cookies. If you prefer bar cookies, you may want to try this easy recipe for Peanut Brittle Bars.